I’m excited to present some tips on home improvements today from Avril Broadley of Grown Gals. Avril has some great input on what you should be considering if you’re planning a home renovation now that the kids are gone. If you like this (and I just know you will) be sure and check Grown Gals for more great stuff. Decide what you want to spend, add a contingency and then add that contingency again. Do this if you are spending tens of thousands or just a few hundred quid. It will help you to make decisions on finishes and materials all the way through the process and keep the project under control. In my experience penny-pinchers get the most fun out of shopping – anyone can buy anything if they have the cash but finding something special on a budget is close to magic. Major home improvements don’t happen that often simply because of the mess, the expense and the hard work involved, especially when a family is in residence. There’s usually an enthusiastic major decoration (or renovation) when a family moves into a new home followed by a long period of neglect with the odd touch-up. This doesn’t apply to everyone, of course, as my own parents’ obsession with annual decoration testified. What empty nesters need to consider is that major works now might have to see them through the next 20 years or more and that means thinking about making the home suitable for that future, and older, self. 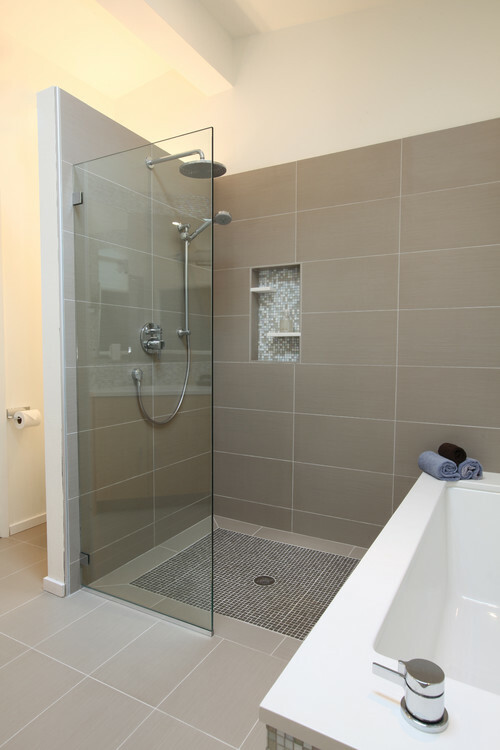 For example, if you’re planning a new bathroom seriously consider installing a walk-in shower to ease the stress of getting in and out of the bath a few years down the line. A downstairs WC will also come in very handy when running up and down stairs is not so easy. I’m not suggesting grab rails and specialist fittings aimed as the less-able – just a stylish step-free shower like the one shown above. I’ve just had to have my basement kitchen removed to sort out a damp issue and it has been an expensive retrograde exercise. If you think there are underlying problems with your property – be it damp, the heating system, the roof, or (in a hushed voice) subsidence – you need to address the issue before embarking on cosmetic work. Building problems never go away on their own and it pays to get a specialist surveyor to advise you on how to tackle them once and for all. The other thing you need to consider is that one job might unearth unexpected issues which will need to be dealt with before you can continue. For instance, a friend recently had a new boiler installed but the old pipework wasn’t up to the new high-pressure system; it has ended up being a much bigger project with more upheaval than she had anticipated. 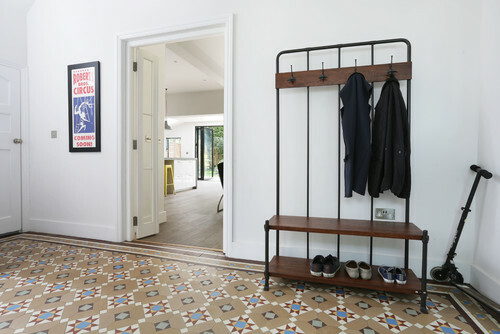 If you’ve seen as many episodes of Grand Designs and Property Ladder as I have you will already know that the original footprint of a home can be re-thought into endless configurations. You can extend, you can knock-through, you can convert. If it’s a big project you’ll need professional advice from an architect who’ll bring plenty of ideas to the table as well as making sure it complies with building regulations and all that boring stuff. RIBA (The Royal Institute of British Architects) has a useful guide on how to find and work with an architect. Another useful website is Houzz.com which features lots of images of real interiors projects alongside full details of the design or architectural company behind it. 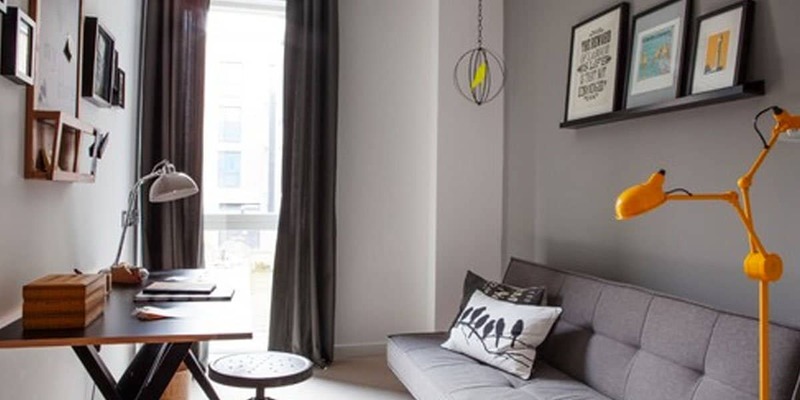 Houzz also allows you to create idea books, as well as search for products and suppliers by location; in short its a very helpful tool and most of the images in this post are from their site. Even if your plans are less ambitious and you are just getting a new kitchen installed, for instance, it’s worth thinking about the current layout and how it might be improved. In the case of kitchens, many suppliers offer a free planning service which can help you understand what is possible. Deep pull-out drawers are more accessible than low cupboards and a wall mounted oven is an efficient use of space as well as being easier on the back and knees. Always remember to take plans home to evaluate before you purchase; planners are also sales people and it is easy to get caught-out by what they want to sell as opposed to what you need. Empty nesters often have vacant bedrooms and while you’ll still need somewhere for your offspring to sleep their old room doesn’t have to remain a teenage shrine. Neutrally decorated spare rooms are more useful and can accommodate all of your guests, including your children’s partners and perhaps even grandchildren in time. If you want space for an office or workroom it’s time to alter the main function of a bedroom so that it can be easily converted back to a spare room when needed. 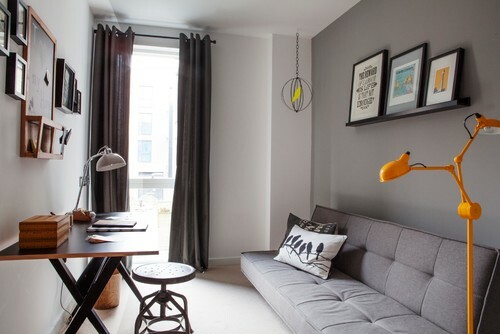 This usually means zoning the room to provide a desk with storage alongside a sleeping area which might be a day bed, a sofa bed, or even a fold-up wall bed. You might also consider turning a bedroom that adjoins the master bedroom into an en-suite bathroom. A private facility is not a luxury as you get older but a practical solution to increased night-time pit stops. It might sound decadent to take over so much space for yourself but its much better to utilize it than have it standing empty most of the time. When choosing new furniture, fittings and materials for floor and wall finishes buy the best you can afford. If you cut corners you’re going to have to replace things in five or ten years time when you might not have the same energy. When I see examples of architect’s apartments from the 50s and 60s –­ they have barely changed in 50 years but still look amazing because they were designed with quality materials that have stood up to decades of use. Encaustic tiles like the ones in the hallway below, for instance, have survived for well over a century in many London homes. Materials such as solid hardwoods, leather, porcelain, stone, marble and quality fixtures and fittings will all repay the extra you invest in them now. What’s more – the children are grown up and so you can have nice things ­– at last. A well-insulated home makes complete sense – it’s more comfortable with lower fuel costs. UK Building regulations mean that new homes are heavily insulated but older homes can be draughty and cost a fortune to heat. Heat rises so first check that loft insulation is deep enough – it’s easy and relatively inexpensive to install but can effectively reduce heat loss and heating bills. Other forms of insulation include double or triple glazing, cavity or solid wall insulation, draughtproofing and insulating pipes and radiators. The Energy Saving Trust has a comprehensive section on home insulation on their website. Once insulated homes can become stuffy, sealing in humidity and reducing air quality. A healthy supply of circulating fresh air is essential. Install humidity fans in bathrooms and kitchens to deal with condensation and if you have mold problems install passive air vents to encourage airflow. One step up from this is a heat recovery ventilator which provides continuous air change, replacing stale moisture-laden air with filtered, fresh, warmed air from outside. By midlife most of us have accumulated quite a bit of stuff that, to be honest, we don’t love –­ it’s served a purpose but never really been part of a design scheme. Now is the time to do a bit of an audit and decide on what you love, what you want to keep and what you actively dislike. Sell unwanted items or donate to one of the many charities who redistribute it to families in need. You will be surprised how much fun it is to discover what you really want your home to look like. Pinterest is a great tool for putting together color schemes and mood boards and it’s a great way to visualize and share your ideas (don’t forget that your partner might not understand the ‘seaside and driftwood’ vision you have in your head). Give yourself plenty of time to source materials and finishes and get as ready as possible. Some things such as radiators might be on a long lead time and you don’t want to hold up a project mid-flow. Do your own research and don’t rely on tradesmen to advise you on the latest products and technology – they will usually stick with brands and suppliers they already know for convenience. Whether it’s making your own curtains, painting a piece of furniture or tiling your own splashbacks there is a great sense of satisfaction to be achieved by injecting a bit of yourself into your home. I’m not suggesting anything structural – leave that to the experts – just a small project that will allow you to personalize your space in some way. If a creative task takes you outside of your comfort zone – all the better – midlife is exactly the time when we need to challenge ourselves. You never know what you can do until you try and a feeling of pride will be rekindled every time you tell a guest ‘I did that myself’. It’s not to everyone’s taste but I love mid-century furniture and spend many a happy hour on eBay searching for vintage pieces for my home. Old pieces are more solid and well-built than their contemporary counterparts. Giving an old item a new lease of life is something I enjoy and it is a more sustainable way of living. Getting a much-loved sofa re-upholstered instead of discarding it also helps to support local artisan businesses and keeps traditional skills alive. My other-half recently spotted this lovely ladderback chair in the street (left), sent me a picture and brought it home. He did the sanding, I did the painting and a local upholsterer (Rachael South) re-strung the seat. We now have a beautiful chair (right) that is loved far more than anything we could have bought new. 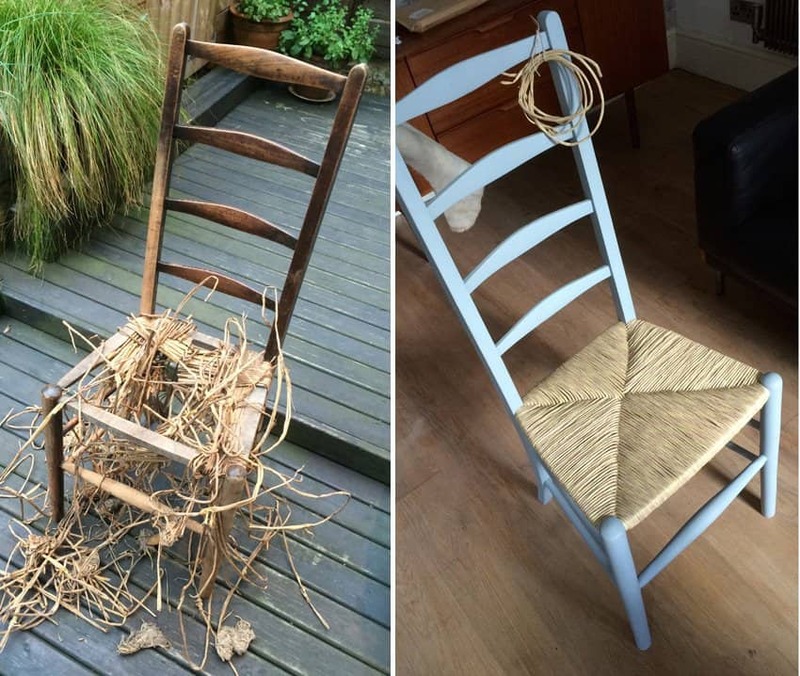 Our street found chair before and after renovation. Improving our homes is all about creating the backdrop to the life we imagine and dream of. In winter, for instance, this might be cozy nights curled up on a sofa in front of a flickering fire. If that is your idea of bliss it makes an open fire a must-have, because, for at least four months of the year, your home is not going to match your vision without it. 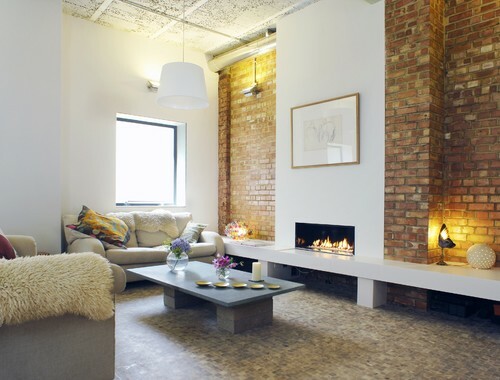 All kinds of decisions follow on from this – chimney or flue, fireplace or stove, living flame gas or real fire? Having used the sensory experience check box to identify the desire you can allow practicality to help make it a reality. How do you really feel about building a fire, cleaning the grate and chopping wood? Do you spend a lot of time at home or do you need to be able to switch on the fire for instant gratification? When we installed a stove to top-up the heat in our open plan kitchen-diner I only considered a wood burning stove for a brief moment; the gas version looks identical but can be turned on for just 15 minutes to eat breakfast and that delivers the experience I was after. Use this sensory method to think about every aspect of your home – this will make it personal to you and by midlife we should all know what makes us happy. 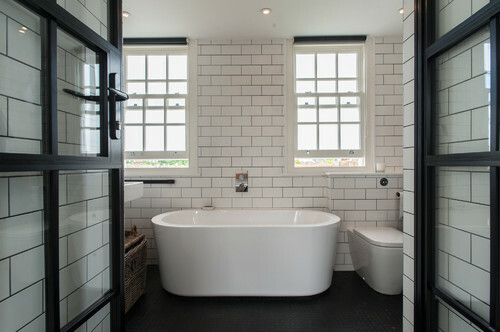 With the kids gone you can be selfish and indulge yourself in that freestanding bath or double oven you’ve always coveted. Just don’t make the mistake of copying someone else’s dream, it might look great in a glossy magazine but that is their life, not yours. 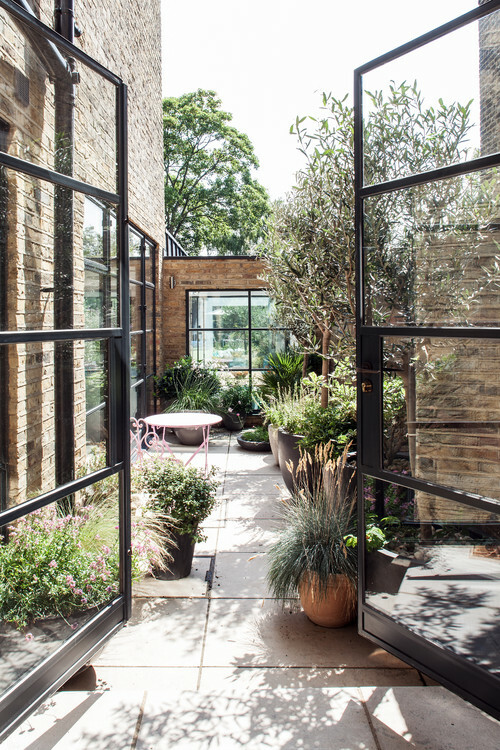 It’s all everyone’s talked about for years – opening up your home with folding or sliding doors to bring the outside in and extend your living space into the garden. The reason it is so popular is because when the sun does shine there is nothing like stepping barefoot into the garden with your coffee and the feeling of warm decking underfoot. But in my London (at least) you cannot guarantee sunshine – so large doors and windows also mean that even when it’s chilly outside you can still enjoy the garden and watch the birds. Whether its an acre of land, a courtyard, a terrace or a balcony, think about the view from inside and make it beautiful. 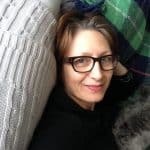 Avril Broadley is a designer living and working in East London with her partner and Mini Schnauzer. She writes a blog: GrownGals.com with the aim of sharing her midlife experiences with other like-minded women.